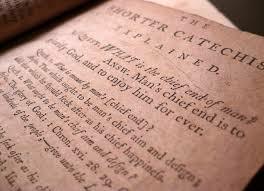 My first encounter with the Westminster Shorter Catechism was in a church membership class. I was 18 years old and had recently become a Christian. While I told the pastor I found reading it helpful, I didn’t imagine using it much afterward. How wrong I was! Thirteen years later, I continually find the Shorter Catechism helpful in my Christian walk and ministry. Here are five reasons I consider this catechism worth engaging today. 1. The catechism gives a helpful summary of core beliefs. In Romans 12 Paul urges Christians to “present their bodies as a living sacrifice” (v. 1). When done in view of God’s mercy, this is an act of “spiritual worship” (v. 2). Among other things, this teaching seems to imply that grasping God’s mercy in both our mind and heart is essential to authentic Christian living. Before we live a gospel-shaped, Christ-exalting life, we must have a firm grip on gospel truth. Of course there are plenty of other documents that can help with this study. It’s likewise true the Shorter Catechism goes a bit beyond the core on some matters. Nevertheless, the first 38 questions and answers offer a succinct, clear, and heartwarming summary of central Christian beliefs. Do you want a firmer grip on central Christian truths? Are you looking for a resource that can help you teach these doctrines to others? If so, engaging with the Shorter Catechism is worth it. 2. The catechism rightly views salvation as past, present, and future. The story goes that an eager evangelist got on a train and asked the man sitting opposite him: “Are you saved?” The other replied, “I am, I am being, and I will be.” Somewhat puzzled at this response, the evangelist tried again: “You don’t understand. Are you saved?” The other man simply reiterated his first answer: “I am, I am being, and I will be.” The other man was Charles Spurgeon. I’m not sure whether this story is authentic or not, but it illustrates a vital point. It’s easy to misconstrue salvation as merely something that happened when I became a Christian, thus overlooking its present and future dimensions. Here, too, the catechism can help us when it talks about ongoing salvation, stressing how believers are renewed in God’s image and increasingly enabled to slay sin and live in holiness (Answer 35). The catechism teaches about future salvation, too, pointing us to the day when believers will be “perfectly blessed, in the full enjoying of God to all eternity” (Answer 38). 3. The catechism calls for whole-life discipleship. This point follows naturally from the previous one. Once the catechism teaches believers about their salvation and their daily fight with sin, it’s no surprise it then offers how we ought to live. This teaching largely comes in the form of a powerful and practical exposition of the Ten Commandments. The catechism doesn’t call Christians to live by the commandments in a legalistic or chore-like fashion. Instead, we take them as an expression of God’s moral will for the lives of his believing people. For example, the explanation of the eighth commandment (Questions 73 to 75) has obvious practical implications for our daily work. In a nutshell, the catechism is thoughtfully arranged to show us how the commandments lead us to the redeeming love of God and help us live in an ongoing experience of that love. 4. The catechism opens the door to the wisdom of the Puritans. When we think about the past, we can easily fall prey to one of two mistakes. The first is to view it through rose-tinted glasses, imagining everything was wonderful “back then.” The other is to ignore it entirely, thus missing out on valuable historical lessons. Would you like to tap into this mine of spiritual gold? The Shorter Catechism is a great place to get acquainted with Puritan wisdom. 5. Our ‘chief end’ really is to glorify God and enjoy him forever. There’s no doubt that the opening answer is the most famous portion of the Shorter Catechism. To realize our chief end is to glorify God and enjoy him forever is to appreciate the whole thrust of Scripture, to see into God’s heart, and to discover our own purpose. A real grasp of this truth can enable us to see that knowing Jesus is eternal life, and that losing our lives for him means finding true life. The catechism’s first answer is worth our engagement. Yet the Westminster divines didn’t just leave us one answer, they offered another 106. And they are worth our attention too. Andrew Conway (MDiv, Union Theological College, Belfast) is the minister of Hilltown and Clonduff Presbyterian Churches in County Down, Northern Ireland. He and his wife, Sarah, have a delightful young daughter, Annie. Andrew is the author of The Shorter Catechism Made Simple.